← Does Godin Get Education Reform Right? STRANGE AS IT MAY SEEM, How I Met Your Mother has an interesting tendency to bring up often-important issues in a timely manner. The show, seen mostly through the eyes of hopelessly romantic Ted Mosby, has always worked the relationship angle. Now that Marshall and Lily are parents, things are even more complicated. In this past week’s episode, Lily and Marshall leave the cocoon of the home in order to find who would be Marvin’s best god-parent. 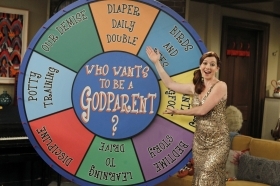 Marshall then uses his knack for game shows to bring the friends into a round of “Who Wants to Be a Godparent?” The game goes well until the Ted, Robin, and Barney leave in a huff for feeling unimportant to two of their best friends. And while the difficult issue is resolved by the end of the episode, it’s something that doesn’t get talked about often. How do you balance friendships when things like marriage and children enter the picture? It’s obvious that some kind of guilt can be felt on both sides (“I don’t have the time” and “I don’t want to be an imposition”). So how do you make it work? What are important things for those in this situation to think about? You can check out the whole episode of How I Met Your Mother here. This entry was posted in Television, The Importance of Being Mosby and tagged friendship, How I Met Your Mother. Bookmark the permalink. It can be difficult. I am one of the last “singles” of my friends. It helps that I love kids and that my life is flexible enough to make things work. But I must admit that I love the times when it’s just me and my friend (no husband or children). 🙂 Love HIMYM btw.